← Sky News and Fifa. Open debate or vested interests? Narrowly beating the soon-to-be-retired van der Sar to the number 1 jersey is Manchester City’s young starlet. At the start of the season, a few eyebrows were raised when Hart was selected ahead of Shay Given, but the 24-year-old’s performances have been of such a high standard that he is now recognised as England’s first choice goalkeeper. 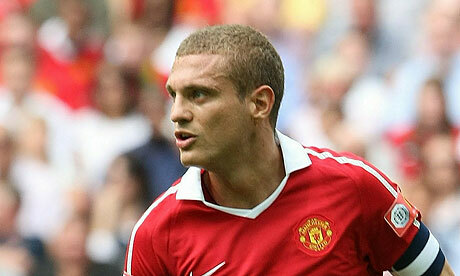 The Serbian is the rock of the Manchester United defence. After taking over as club captain at the start of the season, United have conceded less than a goal per game, which played a big part in their 19th Premier League title win. The no-nonsense defender also scored five league goals this season, including the winner in the crucial victory against Chelsea at Old Trafford. After joining Stoke City in 2009, the uncompromising German centre-back has been an integral part of the team’s remarkable recent progress. At the time of writing, he had scored 13% of the club’s league goals: an amazing statistic for a defender. To put this into perspective, Nicolas Anelka accounted for just 12% of Chelsea’s goals in the Premier League. Huth might be a surprise choice in our team of the season, but he is deserving of his place. Despite having conceded the fewest goals in the Premier League this season (along with Manchester City), Chelsea failed to retain the title, however, the Chelsea captain’s performances have been up there with his very best (when Terry plays, Chelsea concede, on average, a goal every 110 minutes). Indeed, his form has been so impressive that England manager Fabio Capello reinstated the 30-year-old as the captain of the national side in March of this year. Standing at 6 foot 3½”, the powerful younger brother of team mate Kolo has been a revelation in his debut season for Manchester City. The high points of the season for the former Barcelona star was his Man of the Match performance against Manchester United in the FA Cup semi-final, where he scored the only goal of the game and, of course, scoring the winner in the 1-0 FA Cup final win over Stoke City. In West Ham’s dismal league campaign, Parker has been their one shining light. The tough-tackling midfielder couldn’t save his team from relegation, but the 30-year-old’s performances earned him the Football Writers’ Association Footballer of the Year award. In the summer, it is likely he will move on, with Tottenham and Liverpool reportedly targeting the midfielder. Since Kenny Dalglish’s return as Liverpool manager, Kuyt has been scoring goals for fun (10 in the 18 league games since Dalglish has been at the helm). With 8 assists to his name, the industrious Dutchman has been Liverpool’s standout player this year. It was a close call between Kuyt and Nasri, who was outstanding for the first half of the season, but Kuyt makes the team for his remarkable hatrick against Premier League champions and fierce rivals Manchester United. It could be argued that no player has been more pivotal to their team than Charlie Adam. The Blackpool player has scored an incredible 12 goals and set up a further 9 for his team mates and was our tip for PFA Player’s Player of the Year award, where he eventually lost out to Tottenham’s Gareth Bale. In a difficult season for Blackpool, which ultimately ended in relegation to the Championship, their captain has been truly inspirational, helping this team to home and away victories over Liverpool and a 3-1 win against Tottenham (gaining himself numerous Man of the Match awards in the process). The Portuguese 24-year-old has the most assists in the Premier League this season with 18 and has played a key role in Manchester United’s domestic success. His new-found maturity is what Sir Alex Ferguson attributes his impressive form to, and with Nani beginning to realise his potential, there is now little doubt that United fans now have a new favourite Portuguese player. This has been the Bulgarian’s finest season in a Manchester United shirt. He finished the season as the Premier League’s joint top scorer with 21 goals – a respectable strike rate of one per 105 minutes he played. He even scored five goals in one match against Blackburn Rovers at the end of November and it was his hatrick against Liverpool in September that proved the difference between the two teams in United’s 3-2 win. This selection may be surprising to some readers, however, there can be no doubting the quality of the West Bromwich Albion striker. This season (his first in English football) Odemwingie won two Barclays Player of the Month awards, becoming only the sixth man to have received the accolade twice in a season. He has scored a remarkable 15 league goals for the club and has 8 assists to his name (the same total as Ryan Giggs and Dirk Kuyt). Do you agree or disagree with James’ selections? Share your thoughts by leaving a comment and don’t forget to follow @gdfeet4abigman on Twitter. This entry was posted in Uncategorized and tagged Charlie Adam, Dimitar Berbatov, Dirk Kuyt, Joe Hart, John Terry, Nani, Nemanja Vidić, Peter Odemwingie, Robert Huth, Scott Parker, Yaya Touré. Bookmark the permalink. This article makes me cringe. No place for Luca Modric, even on the bench? Hard to argue with the squad as a whole, though I could argue with the first XI. I agree with you, it’s very hard to choose a starting XI, especially – as you mention – there are many players who had excellent short spells of the season but went missing for other parts of it. I left Modric out because I think his reputation is bigger than his performances against the so-called bigger teams. Young, 3rd or 4th choice striker at the start of the season but has come up with important goals against ‘big’ and ‘little’ teams. Though I forgot about him initially so I can see how you did! I love Hernandez, but he’s played about half as much as Berbatov and Tevez. Like you say, though, Hernandez has probably make the best immediate impact in his first season in the PL (though Charlie Adam fans may disagree). i was really prepared to agree on this but there are some really oddball choices. especially dirk kuyt, who has been solid but uninspiring. he was the main striker for their last four europa league games, where they scored a grand total of 1 in 360minutes of football. the hat trick against united was the least impressive i have ever seen. his penalty taking has been fantastic but he’s no nasri. and i’m a liverpool supporter. This is my Premier League team of the season, not my Europa League team of the season. Kuyt has been brilliant in the last half of the season. As you rightly say, he – and the other Liverpool players – did not play well in the first half of the season, but Kuyt’s amazing contribution for the final (and arguably most important) half of the season has been acknowledged here. weight I must say, as a whole lot as I enjoyed reading what you had to say, I couldnt help but shed interest following a even though. Its as should you had a wonderful grasp on the topic matter.